Home / Understanding Order Types / How Take Profit works? Take Profit orders are used to set a target profit price on an unleveraged spot trade or a leveraged long or short position. The profit price is to be set in terms of absolute price. As with Stop orders, Take Profit orders can also be used to open positions. Take Profit: Triggers a next order type when the last market price hits the stop price. Next order can be Market Sell, Limit Sell or Trailing Stop Sell. Most traders use take-profit orders in conjunction with stop-loss orders (S/L) to manage their open positions. If the security rises to the take-profit point, the T/P order is executed and the position is closed for again. If the security falls to the stop-loss point, the S/L order is executed and the position is closed for a loss. The difference between the market price and these two points helps define the trade’s risk-to-reward ratio. The benefit of using a take-profit order is that the trader doesn’t have to worry about manually executing a trade or second-guessing themselves. On the other hand, take-profit orders are executed at the best possible price regardless of the underlying security’s behavior. The stock could start to breakout higher, but the T/P order might execute at the very beginning of the breakout, resulting in high opportunity costs. Take-profit orders are often placed at levels that are defined by other forms of technical analysis, including chart pattern analysis and support and resistance levels, or using money management techniques. 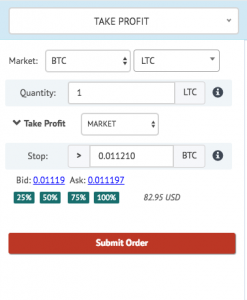 Now, click on the drop-down menu near Take Profit. It will pop up 3 options: Market, Limit, and Trailing. Selection of an option means when market price (bid price) rises to the Stop value, the selected order in the drop-down menu will be executed (Market Sell, Limit Sell or Trailing Sell). 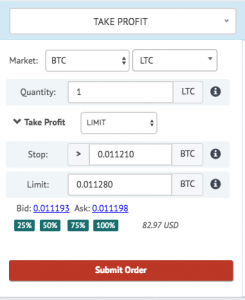 E.g if the current bid price of LTC is 0.011184 BTC. Stop value can be a place at 0.011210, 1% above the current price. *Note: Always make sure the Stop Value is higher than current Bid Price. Suppose the current bid price of NEO is $100. Now someone placed a Take Profit with Market Sell order, for 1 NEO coin with a stop value $110. Now when the NEO market bid price hit $110, a Market Sell order will be placed at $115. Suppose the current bid price of NEO is $100. Now someone placed a Take Profit with Limit Sell order, for 1 NEO coin with a stop value $110 and a Limit value $115. Now when the NEO market bid price hit $110, a Limit Sell order will be placed with limit value $115. Suppose the current bid price of NEO is $100. Now someone placed a Take Profit with Trailing order, for 1 NEO coin with stop value $110 and Trailing offset 3%. Now when the NEO bid price hit $110, a Trailing Stop Sell order will be placed. Let’s say market hit $120 and then start correcting. When the market bid reaches $116.4, a Market Sell order will be placed. 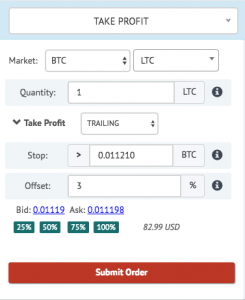 do you have to place a sell order on your binance exchange then a trailing stop sell order on Trailing crypto platform…how do you sell a coin and what would you expect to see on the trailing crpto platorm wallet will ir be under available or pending. How would you know if the trailing stop sell has been activated….please could someone explain step by step how the process will work and what indicators you are to look out for to know that your command to trailing stop has been activated and is will be successful. All advance orders remain on Trailingcrypto platform until final execution. At the time stop is hit either a market order or a limit order is placed on the respective exchange. You can click on refresh icon in open orders tab to get the current status of all open orders including trailing ones. What should be the offset value is an individual decision and depends on many factors. we shouldn’t give any recommendation on that. Why $115? Should not there be $110? My undertanding is that the Market Sell order value in Case 1 in hypothetical example above should be 110 and not 115.